SCVHistory.com | Film-Arts | James Dean: Did He or Didn't He? James Dean: Did He or Didn't He? Hollywood bad boy ate his last meal in the Santa Clarita Valley. Maybe. It had been reported in the past to be possibly the last meal for legendary actor James Dean at a Tip's Restaurant in the Santa Clarita Valley on Sept. 30, 1955, just hours before his young life came to an end in a tragic auto accident near Paso Robles. Dean began his movie career in 1954 and had just completed his third movie, "Giant," when he met his untimely end. In spite of his short career, he remains one of the most popular actors in Hollywood history. Dean was born Feb. 8, 1931, in Marion, Ind. He attended high school in Fairmount, Ind. After graduating in 1949 he moved out to California where he majored in pre-law at Santa Monica College, and then drama at UCLA, much to the chagrin of his father. He began pursuing his acting career full-time in 1951. Between 1951 and 1954 he appeared in various television programs with limited success, but it was his role as a North African house boy in the theater production of "Bachir" in 1954 that got him attention from Hollywood movie makers. In 1954, Dean was cast in the first of the three films that brought him into the realm of Hollywood immortality. Elia Kazan, director of "East of Eden" (based on John Steinbeck's 1952 novel) was looking for a Brando-like actor to play the role of the rebel son of a disapproving father (played by Raymond Massey). Dean, still a relative unknown, was recommended for the role and, with the enthusiastic endorsement of Steinbeck himself, quickly established himself as Hollywood's rebel loner, much to the delight of a vast teenage audience. For his role in "East of Eden," he would later receive the first posthumous Best Actor nomination in Hollywood history. "East of Eden" was quickly followed by his ultimate legendary role as a rebellious and misunderstood high school student in "Rebel Without a Cause." The film also featured young talents Natalie Wood and Sal Mineo and included a now-famous scene shot outside the Griffith Observatory. "Rebel" would prove to be enormously popular with the teenage audience and cemented Dean's place in Hollywood history. Dean's last film, "Giant," saw him playing a supporting role to Elizabeth Taylor and Rock Hudson. The film was released in 1956 after his death and resulted in a second posthumous Best Actor nomination at the 1956 Academy Awards. As historians, we see time and time again the effect that untimely death at a young age can have on long-term fame. Marilyn Monroe. John F. Kennedy. James Dean. Dean became interested in auto racing while filming "East of Eden." 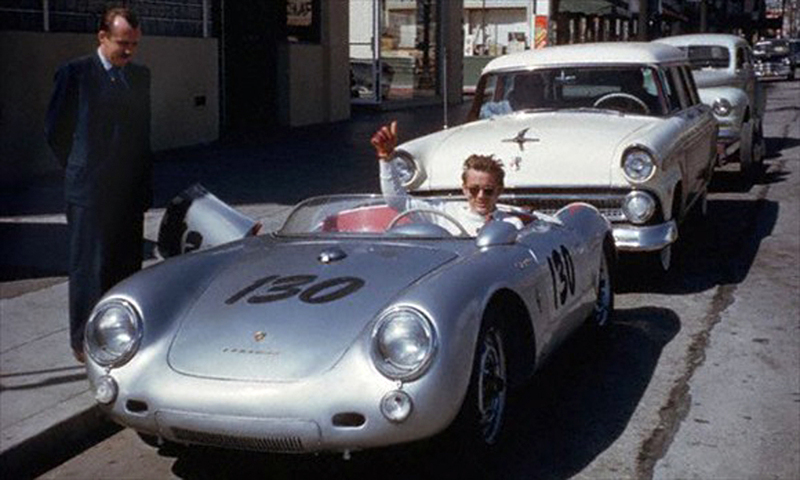 During the filming of "Rebel," he purchased a Porsche 550 Spyder. He was barred from racing while filming "Giant," but upon completion of the movie, he decided to drive the Porsche up to Salinas to compete in auto races at the Salinas Airport. As with many events in history, there are grey areas that historians can neither prove nor agree upon. The day of James Dean's death is no exception. On Sept. 30, 1955, Dean started out from Los Angeles with his 29-year-old mechanic, Rolf Wütherich, in the Porsche. They drove into the Santa Clarita Valley along Highway 99 and by some accounts may have stopped for lunch at a Tip's Restaurant – the location of which was probably at the current Marie Callender's site at the corner of the Old Road and Magic Mountain Parkway. Althea McGuinness, a Tip's waitress who died in the 1970s, was reported to have served Dean at the restaurant. An article in The Signal newspaper in September 2005 recalls a 1985 interview of former Tip's manager Carmen Cummings, who told Signal publisher Tony Newhall, "Yes, he did stop there on his last day. He sat at the counter. We all recognized him." After his purported meal at Tip's, Dean proceeded north up Highway 99 and down the Grapevine Grade into the San Joaquin Valley. There he was ticketed by CHP officer Otie Hunter for speeding. He proceeded west on U.S. Highway 466 (now California Highway 46) and climbed over Polonio Pass headed towards Paso Robles. Dean's auto was estimated to be traveling at 55 mph as he approached the town of Cholame on the downgrade from the pass. Just outside of Cholame, Highway 466 met Highway 41 in a "Y" intersection. Coming in the opposite direction was a black and white 1950 Ford Custom Tudor coupe driven by 23-year-old Donald Turnupseed, a Cal Poly San Luis Obispo student who was traveling to Tulare to visit his parents. As he approached the "Y" intersection, Turnupseed began to make a left turn on to Highway 41. Due to the twilight conditions and the color of Dean's car, Turnupseed never saw the approaching Porsche. The two cars collided in a horrific, nearly head-on crash, with Dean's car ending up crumpled in a ditch by the side of the road. Dean was pronounced dead on arrival at Paso Robles War Memorial Hospital. His last words were reported to be, "That guy's gotta stop. He'll see us." Dean's body was brought back to Fairmount, Ind., where he was buried in Park Cemetery at a funeral attended by 3,000 people. A young life was ended prematurely at the age of 24, but a Hollywood legend was born. History is a dynamic process. Sometimes we must revise historic "fact" as new evidence comes to light. That may or may not be the case with the last day of James Dean. I talked with a number of our local experts and found quite a lot of disagreement as to what actually happened in the Santa Clarita Valley that day, Sept. 30, 1955. Where was the exact location of the Tip's Restaurant? What did Dean actually order at the restaurant? 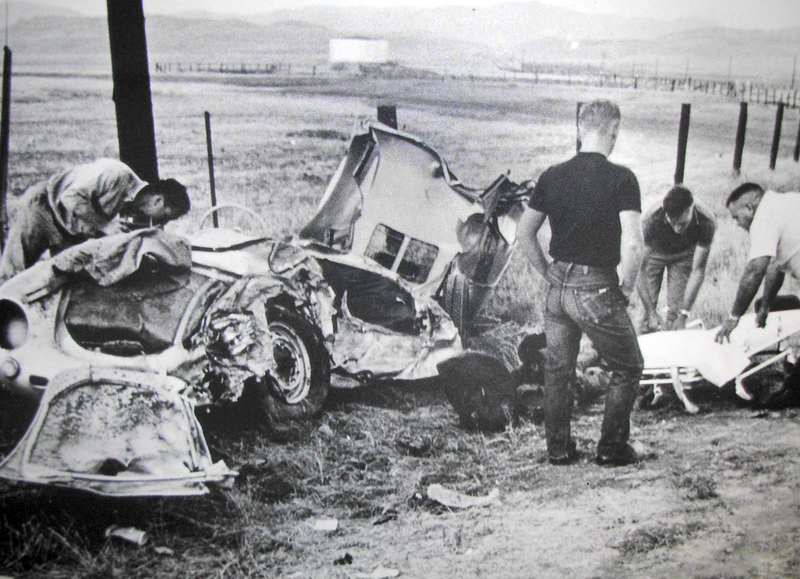 Did James Dean even stop at Tip's on his way to the fatal accident at Cholame near Paso Robles later that day? So I decided to investigate this further, and the answers we came up with may change the local history of the James Dean saga. Leon Worden told me about a book called "The Death of James Dean" by Warren Beath. I found Mr. Beath's website, www.whokilledjamesdean.com, and contacted him to see if he had any additional evidence that might solve the mystery of James Dean and Tip's restaurant. Tony Newhall had interviewed a former Tip's manager for an article in The Signal in 1985. She stated they had indeed seen Dean at Tip's that day. A waitress at Tip's had previously stated she had served Dean apple pie and milk at Tip's. But other than the testimony of these two ladies, we did not have any other evidence to support their statements of Dean's having stopped here. Beath initially was not sure of the answer, either. He had been aware of the controversy, and noted that some of the fan magazines at the time had mentioned a stop at Tip's - but that this may have been taking some poetic license. As far as we know, there was never any mention of Tip's in any of the testimony provided by the people who actually accompanied Dean that day. There was no account of Dean's death in The Newhall Signal newspapers of October 1955. Then Beath provided us with a 1960 German Porsche magazine which contained an article featuring an interview with Dean's mechanic, Rolf Wütherich. Wütherich had driven with Dean from Hollywood in his Porsche 550 Spyder on Sept. 30, 1955, and was severely injured in the accident when Dean's auto collided with Turnipseed's Ford Tudor Coupe. Dean, of course, was killed in the accident. The article was written in German, and Beath had never had the opportunity to translate it. But thanks to Leon Worden, we now know what it says. In the article, Wütherich states that the original reports of his recollection of the day Dean died actually came from his ex-wife while he was still in the hospital and were essentially untrue. Per his actual recollection, Wütherich and Dean left Hollywood in the Porsche and drove for three hours before stopping at a roadside refreshment bar on Highway 466 called Blackwell's Corner. At Blackwell's Corner, Wütherich says he had an apple while Dean drank a Coca-Cola. They left Blackwell's Corner around 5:45 p.m. and proceeded to the crash site outside Cholame. There is no mention of a stop at Tip's. If they drove for three hours straight from Hollywood, that would put them well past the Santa Clarita Valley before stopping. Although Wütherich's recollection might have been a little shaky (he states that Dean was stopped for speeding at 50 mph in a 45 mph zone in Bakersfield when in fact the CHP traffic ticket cited Dean for doing 65 mph in a 55 mph zone outside Bakersfield), if his statements in the Porsche article are accurate, then it raises the distinct possibility that James Dean passed through the Santa Clarita Valley but did not stop at Tip's Restaurant on the day of his fatal accident in 1955. On the other hand, Tony Newhall pointed out to us that both the manager of Tip's whom he interviewed in 1985 and the former Tip's manager who was actually there in 1955 stated that Dean indeed stopped at Tip's on the day of his death. The 1985 manager said Dean stopped at "Tip's Coffee Shop" (which would be at the current Marie Callender's site) and not at the main Tip's at Castaic Junction. The former manager, Carmen Cummings, also stated that police came by the restaurant a few days later to speak with anyone who had seen or waited on Dean at the restaurant that day. She recalled that although they had not done so, the restaurant people were afraid that they would be accused of serving Dean alcohol and sending him off drunk. In spite of their fears, no such accusation ever came from the police afterward. Newhall tells us the witnesses he interviewed appeared to have no motive to misrepresent what they knew about the incident. They spoke candidly, did not seem interested in getting any publicity, nor in perpetuating any myth. Newhall further notes that although only one of Dean's movies ("East of Eden") had been released at the time of his death, he was already quite well known and could have been recognized as a celebrity, particularly by any young people who were at the Tip's that day. Furthermore, even if the waitresses had not recognized him immediately that day, they may well have realized only later who their famous customer was after the accident and the police visit. 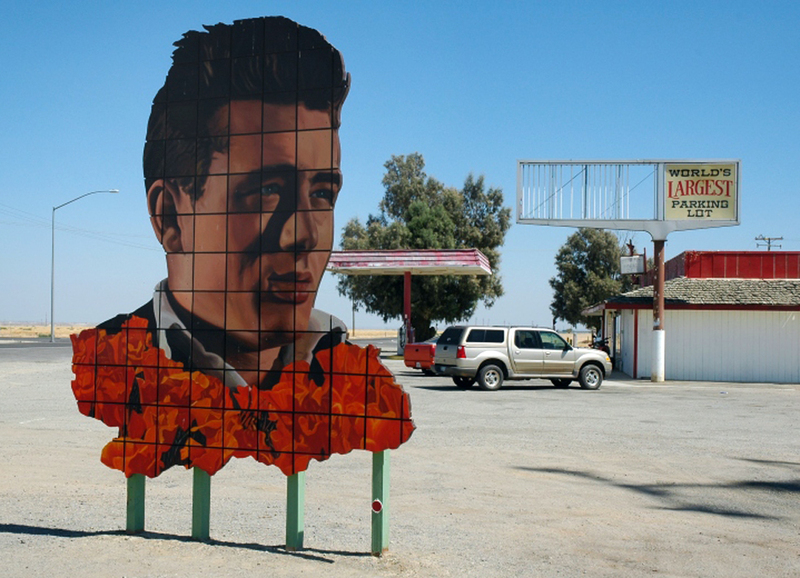 So, did James Dean actually stop in the Santa Clarita Valley on the day of his death? Based on the evidence we have, it would depend on the accuracy of Wütherich's account in the Porsche magazine or the testimony of the workers at Tip's restaurant. Now, so many years later, we may never know for sure. Whatever the course of events on Sept. 30, 1955, the legend of James Dean lives on to this day. The stainless steel monument dedicated to Dean that sits in a parking lot in Cholame was actually erected by a fan from Japan, attesting to Dean's worldwide appeal and fame. 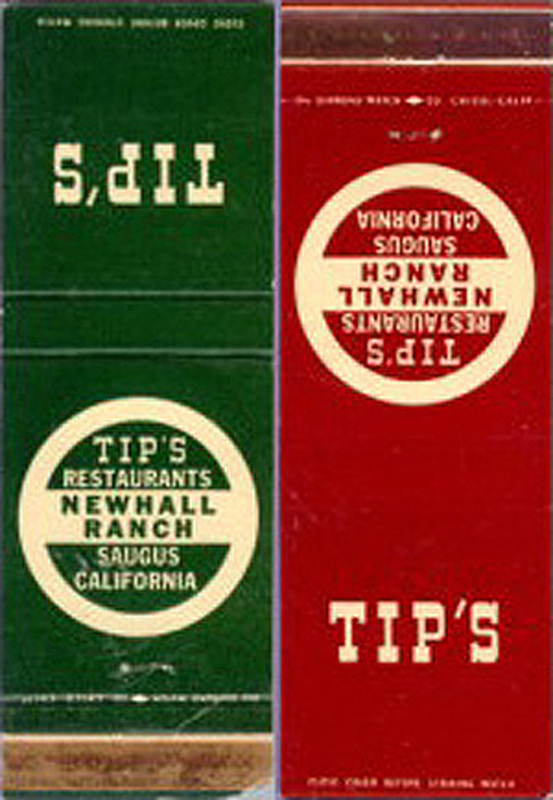 As for the location of Tip's Restaurant, based on review of old menus and local phone books, and information from Tony Newhall, it turns out there were two Tip's locations along Highway 99 in 1955: one at Castaic Junction (the current I-5/Highway 126 junction), the other at the current Marie Callender's site (Old Road/Magic Mountain Parkway intersection). There was also a Tip's on Sierra Highway, and later a Tip's on Pico Canyon Road (the current Lyons Ave/I-5 interchange). The Tip's at the Marie Callender's site was called Tip's Saugus Road in the menus and phone books, and was locally known as Tip's Coffee Shop. It went out of business around 1967 and was replaced by the "Calico Kitchen" for a 12-month period. Then it was leased to a new owner and opened as J's Coffee Shop in 1969 or 1970. J's was later torn down and replaced by the Marie Callender's that we know today. J's Coffee Shop was also the site of the Newhall Incident of April 1970, in which two gunmen murdered four young CHP officers in the J's parking lot.